Hummus is served in many ways - you can serve it as a dip with pita bread, it is also used as a spread for falafel wraps. For those who are interested in healthy snacking, you can have dollops of it with carrot sticks or cucumber pieces. When you think Lebanese cuisine, the first dip that is likely to come to your mind is - Hummus. The basic version of it is typically made with chickpeas, olive oil, seasonings and lemon juice. So, for my second post of BM #79 under Lebanese Cuisine, I am sharing a simple recipe for this ubiquitous dip. 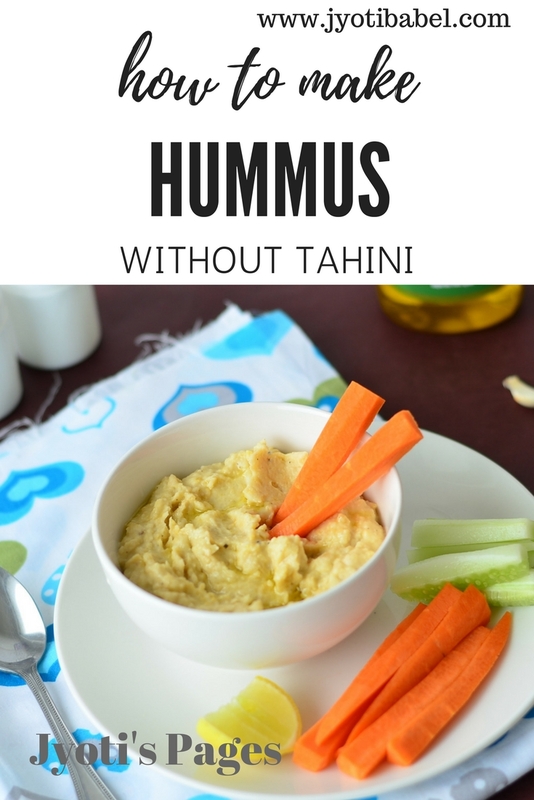 The recipe for hummus I am sharing today is without tahini. Tahini, one of the optional ingredients in hummus is actually sesame paste made with a little bit of oil. I had hummus for the first time when I was living in Dublin and to tell you the truth, I was not very delighted with its taste. For our Indian palate it seemed a little too bland - in my view, the one I had wasn't seasoned well - it could do with a little more salt and lemon juice. In the versions I have tried at home, I use lemon juice a little too generously. Let's check out how I make the basic version of hummus. 1. Add everything in a blender jar and start churning; add water as needed to make a smooth paste. 2. Taste and adjust the seasoning as needed. 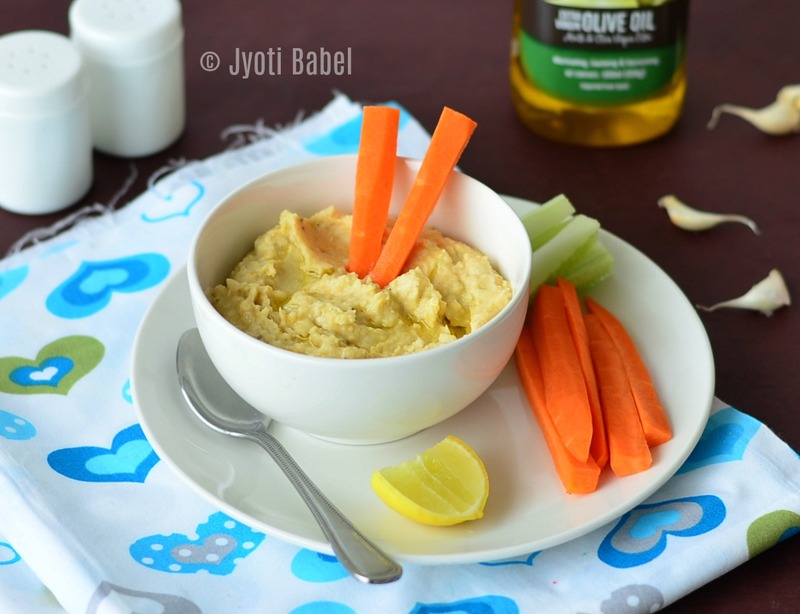 Serve drizzled with little olive oil and lemon juice with carrot and cucumber sticks or with some pita bread chips. We love hummus and it's varieties too. As you said, it's an acquired taste but if you like first time you will love it always. Lovely Capture.. It looks so catchy. I should give a try soon!! I add a couple of green chilly to spice it up and we simply love that version , try it , we Indians like spice. This looks wonderful. Best option for a healthy snack. I make hummus of all sorts at home and we love it but just realised that I haven't blogged the recipe as yet ! Sometimes we forget about simple dips and chutneys. I like your tahini free version. one of the best and easiest condiments to make! Looks delish and pictures is so inviting!